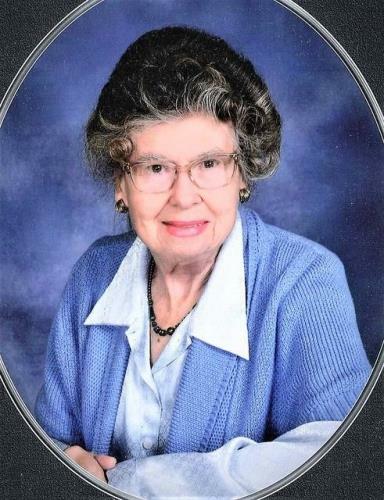 JEFFERSON —Lois Edna (Prusia) Meyers, of Jefferson, WI, passed from this life to the next on the morning of Friday, March 15, 2019 at the age of 89. Born on July 31, 1929 in Peoria, Illinois, she was the only child of Edna Ruth (Anderson) Prusia and Cedric Edmund Prusia. She grew up in Wood River, Illinois, graduating from Wood River High School and from Shurtleff College in Alton, Illinois. While at Shurtleff studying business, she met Franklin Howard Meyers just back from overseas service in the Army. They married in June 1951. Three years into a promising career in retail management, Frank suffered a serious brain abscess in 1954 shortly before the birth of their only child, Franklin Bradford. Lois rose to the amazing challenge of nursing both her healthy newborn son and her seriously ill husband. With the help of family, she and Frank founded a "mom and pop" paint and art supplies store known as Handy Paint and Art in Wood River in 1957. Lois developed a loyal customer base in the custom picture framing and art supplies area, while Frank handled paint supplies and assembled the picture frames. Both were recognized for 33 years in business as the Grand Marshalls in the Wood River Homecoming Parade in 1989 shortly after their retirement. Lois and Frank enjoyed 15 years of retirement together— traveling, visiting family, and enjoying their yard until Frank passed away in 2004. Lois then moved to Jefferson to be closer to Brad, his wife Gretchen Geist, and their children, Elise and Cedric. Lois served her community in many different ways. A member of Zonta International, she was the Alton/Wood River club president. She held a leadership role in the Greater Alton/Wood River Chamber of Commerce and a foundational role in SCORE, the area small business association. She was active in the Daughters of the American Revolution. She spearheaded the DAR Good Citizen program at the Jefferson/ Fort Atkinson chapter until her failing memory necessitated passing the baton. Lois volunteered with Fort Hospital Partners until 2017. Over the years Lois served as an elder at the First Presbyterian Church in Alton, Illinois and more recently attended St. Mark's Lutheran Church in Jefferson. She often commented how happy she was to be here in Jefferson— "such a charming town." Working in her yard, tending her flowers, feeding the birds, picking up sticks—all things Lois enjoyed. She became known locally in her efforts to rescue stray cats, have them spayed/neutered and then adopt them or release them back to their colony. She relished a bowl of ice cream while watching the History Channel with a cat on her lap. A hot cup of black coffee, classical music in the background, and the County Union in hand and Lois was content. Lois was an avid Amtrak passenger travelling all over the country, both with Frank and after his death, enjoying the passing scenery and visiting with fellow passengers. Lois very much enjoyed her small close-knit family and spoke with pride about her grandchildren, Elise and Cedric. Elise (Meyers) Duwe earned her MD and PhD degrees from the University of Illinois and is currently a resident physician in Family Medicine at the Northeast Iowa Family Medicine Residency Program in Waterloo, Iowa. In 2014 she married Henry Duwe, who is now a professor at Iowa State University in Ames, Iowa in the department of computer engineering. They are the parents of Adelaide and Henry, Lois' great grandchildren. Cedric is completing his PhD in Electrical Engineering at the University of California, Santa Barbara. He will marry Magen Humbert at the end of March 2019 in California. The couple currently resides in Goleta, California. Gretchen volunteers as a family nurse practitioner at Open Arms Free Clinic in Elkhorn, Wisconsin. Brad practices family medicine at SSM Health in Waterloo, Wisconsin and has achieved the rank of Colonel with the 115th Fighter Wing at Truax Field, Madison, Wisconsin. Lois's warm smile and a kind word to everyone was endearing to those who knew her. She went the extra distance to satisfy her customers, to get to know her neighbors, and to give time and treasure to community organizations. Lois Meyers will be missed. Lois will be remembered this Saturday, March 23 at St. Mark's Lutheran Church in Jefferson, Wisconsin beginning with visitation at 10 a.m. followed by a celebration of her life at 11 a.m. officiated by Rev. Jeanette Thorp. Lois will be laid to rest alongside her husband Frank at Woodland Hills Cemetery in Rosewood Heights, Illinois at a later date. Brad and Gretchen would like to thank the staff at Sienna Crest, Fort Atkinson for their professionalism and compassion while caring for Lois during the last months of her life. Lois had a lifelong devotion to cats and dogs. Please consider a gift to the Jefferson County Humane Society in her name as recognition of the great work they do for our animal friends. This is requested in lieu of flowers. She would value such a gift as an enduring memorial to her life.